Testosterone replacement therapy (TRT), also known as Androgen replacement therapy (ART), is a class of hormone replacement therapy in which androgens, often testosterone, are replaced to treat conditions in which the testes do not produce enough testosterone due to absence, injury, or disease. Testosterone deficiency amongst men above the age of 30 years is becoming a common problem nowadays due to life style changes and is characterized by fewer erections, fatigue, thinning skin, declining muscle mass and strength, more body fat. Globally increasing population with testosterone deficiency is expected to remain key growth driver during the period of study. However, side effects of the testosterone replacement therapies are expected to be a key challenge for the industry players during the same time. Geographically, North America dominates the testosterone replacement therapy market driven by best in class infrastructure, easy access to healthcare, higher awareness about the disease amongst citizens as well as practitioners, and higher spending by the citizens towards healthcare expenditure. North America was followed by Europe and Asia-Pacific as second and third largest markets for testosterone replacement therapy market. Asia Pacific is projected to have the fastest growth, owing to rapidly developing medical infrastructure, increasing medical tourism, increased spending, and increasing awareness amongst population in developing nations such as China and India in this region. This report identifies the global testosterone replacement therapy market size in for the year 2014-2016, and forecast of the same for year 2021. 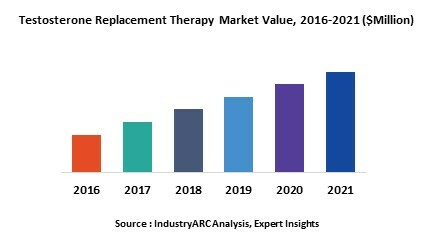 It also highlights the market drivers, restraints, growth indicators, challenges, and other key aspects with respect to the testosterone replacement therapy market.